Metamaterial "atoms" absorb and re-radiate light like real atoms, allowing unique capabilities for imaging and communications. 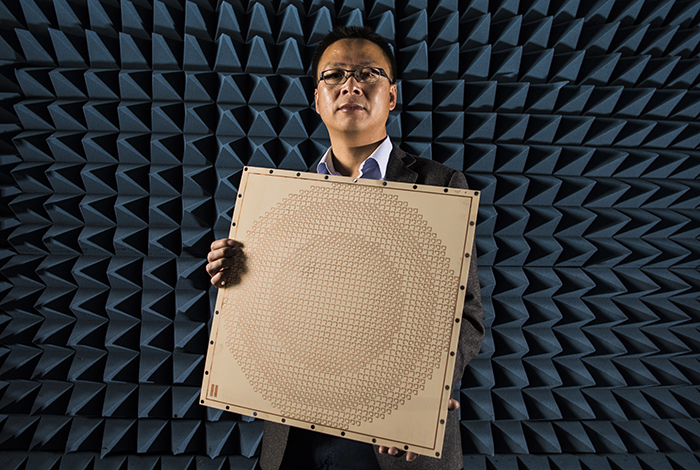 Los Alamos scientist Hou-Tong Chen tests his metasurface inventions in this anechoic chamber, where foam spikes on the walls, floor, and ceiling prevent electromagnetic reflections. The metasurface lens behaves like glass, but without any of the thickness or heft. In his research into advanced electromagnetic-transmission technology, Hou-Tong Chen, of the Los Alamos Center for Integrated Nanotechnologies, pursues the new with a nod to the old. He’s inventing a new generation of ultrathin metamaterial devices for manipulating electromagnetic waves in the microwave, terahertz, and infrared bands, with the promise of enabling flat, light-weight, and low-cost components for important communication and imaging applications. At the heart of each device are a bunch of tiny metallic rod and loop antennas.